Created as a pony car to challenge the ford mustang, the chevrolet camaro was relentlessly plugged for 1967, its inaugural year. Gm even sponsored a camaro stage review and a camaro collection of womens clothing. The 1968 version of this hardtop coupe and convertible was little changed, but it won further acclaim in racing form. Many choices once again the camaro came with a variety of six-cylinder and v8 engines, of which the 230-cu.-in. Six or 327-cu.-in. V8 were standard. The optional super sports top-performance engine was a 375hp, 396-cu.-in. V8, while the z-28 option package came with the 302-cu.-in. Big-port v8. This engine was officially rated at 290 hp. Included in the package were heavy-duty suspension and transmission, power front disc brakes and rear spoiler. The rally sport option, usually combined with the ss, included blacked-out grille and concealed headlights, while the ss-396 had its own distinctive hood. trans-am terror camaro offered so many options that a race car could be built from the smorgasbord of parts available or the z-28 package could be used for that purpose. Piloting a z-28 for roger penske, mark donohue captured the 1968 trans-am series drivers title, winning 10 of 13 races. 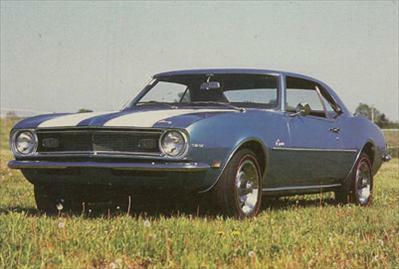 The 1968 chevy camaro continued to challenge the ford mustang for pony-car sales. Its high-performance z-28 version won honors in trans-am racing competition.